In S1, you don't really see the image on this shirt, but I caught a brief glimpse of it in Bugs, and that was enough for me to decide that it was the same shirt. It's a worn red t-shirt with an image of a man. It actually oddly looks like a man in an old fashioned swimsuit. In Dead In The Water (1x03), Sam wears it after the second death (the kid in the sink), and keeps it on all throughout the main action of the episode, but changes before the final scene. In Bugs (1x08), Sam is wearing it from the very beginning of the episode, when he and Dean are at the biker bar, and when they do their initial investigation of the subdivision – including going to the bbq. 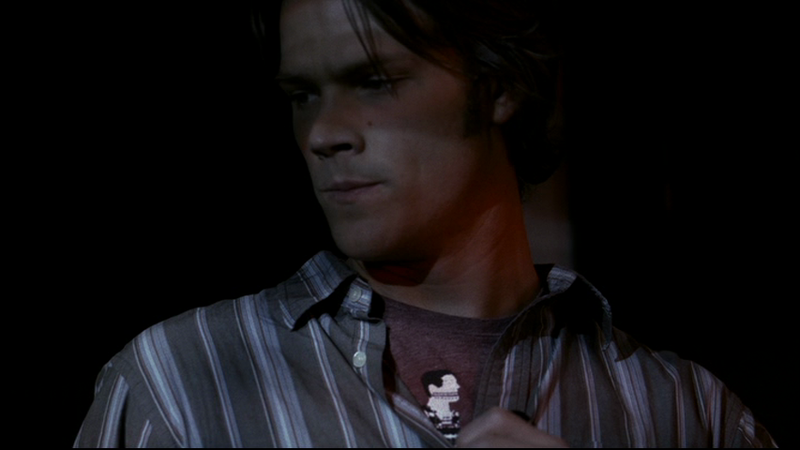 In Faith (1x12), Sam wears it at the end of the episode when Layla comes by to say goodbye. In Hell House (1x17), Sam wears it to see Harry and Ed off at the end of the episode. In Simon Said (2x05), Sam wears this shirt from the beginning of the episode until they get to Guthrie Oklahoma, where he changes into a suit. In Nightshifter (2x12), Sam wears it the entire time he is at the bank. In No Rest For The Wicked (3x16), Sam wears it from the beginning of the episode until they get the knife from Ruby. FATE: Unknown (in the show, but the first comment to this post tells us that this T-shirt was sold at the Supernatural wardrobe sale in spring 2013 and is now lovingly owned by bardicvoice).